This book is a three story collection of Christmas stories that takes place in Maine. 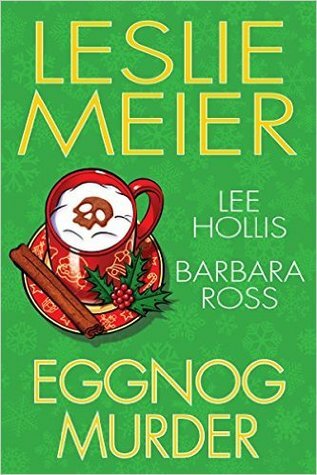 One story is Eggnog Murder by Leslie Meier, another is Death By Eggnog by Lee Hollis and the third is Nogged Off by Barbara Ross. Having read two of the three authors before, I figured I was in for a treat reading this book. And I was right. Although all three stories are more like novellas than a full length book, I still felt like the stories were worth the time they took me to read. All three had delightful characters, great descriptions, and mysteries worth solving. If you are fans of these authors, you will be happy to see your favorite characters and will like spending more time with them. If these are new-to-you authors, this is a good way to be introduced to them and check out their writing style. Either way, this is a book that you should check out. I enjoyed this one as well. I agree, even thought they were short, they were still well developed. Yeah and not novellas are like that, but this one was.. Thanks for re-blogging. I appreciate it. I haven’t read this one because of two reasons, short stories and Christmas books. I most are full of sentiment. Both re probably excellent reads. I normally don’t like short stories either, bit this was good. I read too fast for them. I stopped buying magazines years ago as I would one read in a few hours.